The Get Clients Online Giveaway is Now Closed! Hey…Christine here! I’m so excited to bring you the 3rd annual Get Clients Online Giveaway! I have gathered a spectacular group of contributors who are providing you with amazing gifts that will help you get cash flow + clients, in less time, online. A big “Thank You” from me to you for being part of the of savvy entrepreneurs taking advantage of these incredible tools. 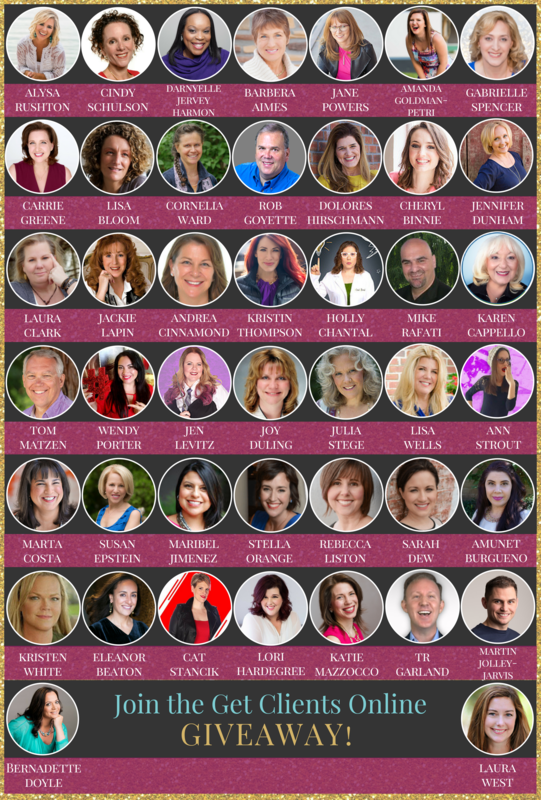 I have teamed up with more than 40 other business industry leaders to bring you templates, checklists, and other valuable goodies to grow and scale a sustainable business that brings you more income with LESS effort. Sweet! All you need to do is enter your name and email address above to get access to more than 40 free business building tools, templates, products and services. Cultivate Your Spiritual Gifts & Reach Your Goals! Magical Meet Up Strategy For A Fast Cash Infusion! Power Up Your Biz Abundance Bundle! More than 40 FREE tools, templates, resources, swipe files, checklists and trainings that you can download immediately. All designed to help you get visibility, get more clients and earn more money! Total value over $50,000. Besides the amazing products you gain access to immediately, you will also be able to enter raffles for even higher value programs, coaching, memberships and VIP services valued up to $6,500! Here is your chance to connect with industry leaders who are committed to helping you get more clients and see more success. These leaders have been in your shoes and know what it takes to create a successful business. One with plenty of amazing clients that you WANT to work with. Grab these gifts now! You will not be bombarded with nagging sales offers during the Giveaway event. You will get the gifts you select. Our contributors are top notch and well respected! No game and no catch! You get to sign up for the offers that you want…that’s it! International business leverage expert, bestselling author, and award-winning business coach Christine Gallagher founded ShesGotClients.com in 2009. Her company is dedicated to teaching entrepreneurs how to leverage their time, marketing, and mindset to attract raving fans, scale their business, and enjoy more income, while at the same time becoming a force for positive change in the world. After applying Christine’s proven business growth methods, which she teaches via her Impact Academy, online courses, and live workshops, her students and attendees typically experience a significant increase in subscribers, clients, sales and lucrative joint venture opportunities. Most importantly, they find a renewed sense of purpose and passion, allowing them to step into their bigger vision, connect to their “why” in order to serve at the highest level, and make a lasting, true impact in the world through a business they love. 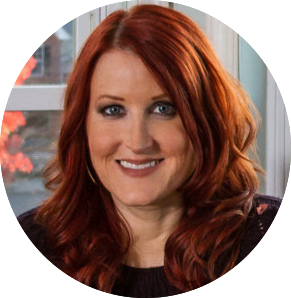 Her newsletters, products, and online reach now educate and inspire over 50,000 people every month. For valuable business growth strategies, visit ShesGotClients.com. How do I know if I will benefit from this Giveaway? You’ll benefit from it if you’re a coach, consultant, author, speaker, trainer, service-based professional, private practitioner, small business owner or other solopreneur—and you’d like to learn how to work smarter, leverage your time, and scale your business! Will I be asked to buy anything on this Giveaway? Will I be bombarded? What’s the catch? No, you will absolutely not be bombarded with offers to buy anything on this giveaway. We’ve seen other giveaways, where contributors very aggressively upsell participants, and we didn’t like that model. There is no catch. We organized this event so that we could meet you, introduce our services to you and show you the many different ways we can support your work in the world. All the contributors represented here believe in relationship marketing… that is, we want to develop a relationship with you over time (if we have what you need), not just sell and run. And to us, a gift is a great way to start a relationship! And of course, we value your privacy and would never spam you – we think that’s gross. How exactly does the Giveaway work? The giveaway opens on Monday, August 6, at 12:01 AM Eastern time and closes Monday, August 27, at 12 midnight Eastern time. When you register to enter the giveaway, you’ll be sent a link to view all the gifts waiting for you. For each one you’re interested in, click the button that says “Give Me Access.” A second page will open on the contributor’s website with more information on their giveaway offer and a sign-up box. The offers that are available to everyone who signs up will be made available for immediate download by the relevant contributor. In the case of giveaways that are being raffled, winners will be notified by the gift contributor no later than August 28 and given instructions on how to redeem their gift. Names will be posted on the giveaway site by September 5. Can I invite someone else to the Giveaway? By all means! In fact, we encourage you to send our giveaway url to colleagues in your professional associations, on the discussion lists you participate in, your Facebook friends, LinkedIn connections, Twitter followers, etc. We want whomever would benefit from these gifts to participate in the giveaway. Do I need to enter the Giveaway raffles every day? Can I enter more than once? No, you don’t need to enter daily to qualify to win any of the giveaways that are being raffled. The giveaway ends on August 27, and the drawings for these items will take place on August 28. Entering more than once won’t improve your chances of winning those gifts. 50+ gifts waiting for you inside!